Not many people know the significance of that salute. The one with the fingers of the hand split down the middle. The one little kids would try to practice and perfect down below their desks during history lessons, down where their teacher couldn’t see it. Little kids and pimply, painfully shy adolescent boys. Even highly successful doctors and IT wizards and physicists in their thirties swamping convention centers dressed up like pimply, painfully shy adolescent boys you would think had outgrown Halloween years before. 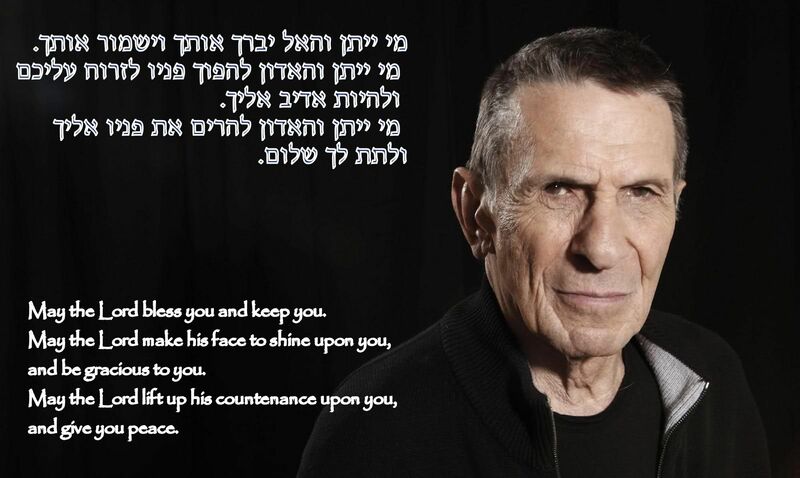 Leonard Nimoy was Jewish, and at the end of the Friday night Sabbath services, a rabbi lifts both hands up with that salute, somewhere around shoulder height, spreading his arms as if to blanket the congregation under its shelter. The version of the story I heard was that the four fingers spread into two was the Hebrew sign language of sorts for the letter “yud”. A double “yud” is the abbreviation for the word “adonai”. It’s a symbol, of sorts, for “God”. Differs from Mr. Nimoy’s own version of the story, but such is the nature of these types of stories. Hebrew for “Live long and prosper”, I would suppose. In essence, it was not meant so much as parting words of hope but as a prayer. You did just that, my friend. Maybe not long enough, and your prosperity will never equal out to the joy you brought to us. And you shared many of those blessings with those of us who so deeply appreciated your work, your artistry and your passion. Thank you for sharing your life with us and becoming a part of ours.